I remember getting the Facebook alerts last year and feeling so nervous about the informational meetings that would provide a glimpse into the brand new Spanish Immersion program that Dare County Schools was implementing. I knew that giving our 5 year old the tools and opportunity to learn Spanish would open a lot of doors for her in the future, but that doesn’t mean that I didn’t have a hundred questions before we officially signed her up for the lottery. I shared a little bit about “why” we wanted Penny to learn Spanish on my last post about Spanish Immersion. I was thrilled to get to meet the superintendent, Dr. Farrelly and his awesome team at the meeting. Having the chance to ask them questions directly and hearing first-hand accounts of those that had experienced a Spanish Immersion program at other schools was so helpful in our decision-making. I really loved hearing what other parents were curious about too. I had brainstormed a lot of questions before the meeting. Most of my questions were about relationships that my daughter would form. You see, my desire to have Penny in this program had very little to do with her academic test scores or the fact that her resume would someday read, “bilingual.” I wanted Penny to learn Spanish so that she would be able to communicate with more people. My main concern was that some of her closest friends would not be in class with her until middle school and that felt a little bit counter-productive when my main goal was to have her communicate with more people. I also didn’t want it to feel like the kids who were in Spanish were getting a better education or feel like it was a competition in any way because I just don’t allow competitiveness to be a part of my parenting journey. My list of questions was lengthy. Today, we’re about 5 months into the dual-language program, and our sweet, sassy Penny girl spends 90 percent of her school day learning in Spanish. Let me clarify for those that aren’t sure what that means. Penny is not spending 90 percent of her school day learning Spanish, specifically. Penny spends 90 percent of her school day learning IN Spanish. She is still learning to read, write and do math. Penny still learns about being a good friend and a good citizen. She came home last week with the full knowledge of why we celebrate Martin Luther King Jr. Day. Penny is still learning about music, art and technology. She is super fired up on P.E. day. 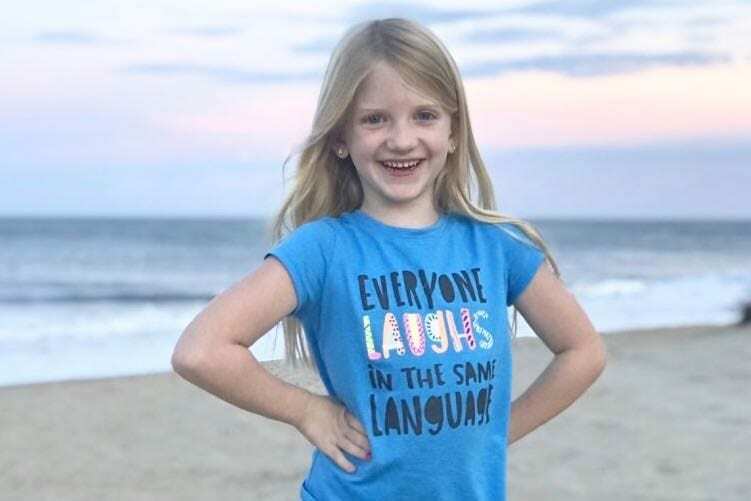 When Penny and her classmates are in their regular classroom, they have two teachers who speak to them and teach them their kindergarten lessons in the Spanish language. Much like Penny learned to speak English as an infant and toddler, she is now learning Spanish by watching and listening. While she was pretty impressed by Dr. Martin Luther King Jr. and his accomplishments, she was not 100 percent thrilled that it meant that she didn’t get to go to school on Monday because Penny truly loves her teachers. She loves hearing about Peru and Costa Rica and she is forever comparing the weather to the warmer climates that her teachers come from, especially on these extra cold days! Penny comes home from school rolling her R’s and teaching her 2-year-old sister, Eloise how to ask for water or how to count to 10 in Spanish. My honest answer is that I wish that there was a revolving Spanish teacher who could teach Spanish to all students as a weekly “special” as addition to the immersion program. I’d love all of the children to be able to learn some Spanish from Kindergarten on. Penny doesn’t have a single complaint about Spanish or Kindergarten, with the small exception to the fact that she wishes lunch was longer so that she could talk to her gal pals just a little bit more. She comes home happy and singing Spanish songs at the top of her lungs. During the initial Spanish Immersion meeting that I attended, there was a lot of talk about how tired the kids would be after school because they are using their brains differently. I’ve noticed that Penny is exhausted and easily irritable in the evenings and even a little bit moody, but we’ve gotten into a pretty good routine to keep her rested and spend our evenings a little bit more quietly. Well, shoot. My 14 year old was right. My big kiddo is super smart and he has had a GREAT education thus far with Dare County Schools long before a Spanish Immersion program even existed. I know that to be true and while I would have been disappointed if Penny wasn’t randomly selected for the Spanish program, I would still be so grateful and happy with her education in Dare County because we are so fortunate to have an administration that is putting our children first. My biggest hope is that everyone who is interested in the Spanish Immersion program will attend the meeting at their school with a list of questions to make sure that it is the right fit for their child. Spanish Immersion shouldn’t be a label that we want our child to wear; it should be something that we feel is right for our individual child. For a small glimpse of what our Spanish Immersion has been like you can check out my Instagram and click on the highlighted post “SpanishKinder” to see how our Penny shares her dual language with us!